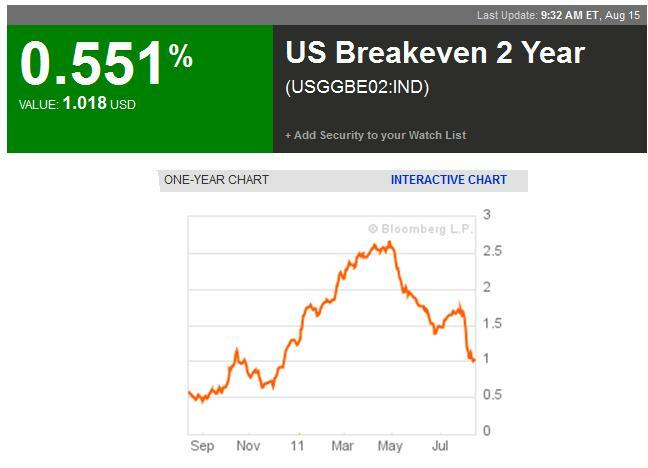 Paul Krugman points to the falling 2-year breakeven rate shown above, which is the implied bond market expectation of inflation over the next two years, measured by the difference in yields between regular and inflation-indexed 2-year T-notes. 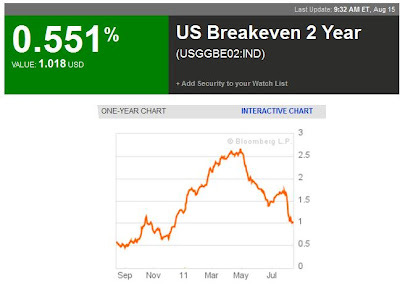 The current 2-year breakeven rate is about 1%, down from 2.5% in May, and suggests that inflationary fears are fading. Just curious, when did Krugman acquire credibility? either that or faith in TIPS as an inflation hedge is failing. or, primary brokers are being forced to buy the TIPS the same way they are being forced to buy the other govvies and then allowed to lever them. no one in their right mind owns unlevered US bonds right now. take the gearing on the TIPS spread up to 10:1 and krugman's argument is exposed for the laughable poltroonery that it is. Fascinating chart. When the Federal Reserve was the big gorilla in the treasury market after QE2 was announced, many of us thought they were artificially keeping rates lower than they otherwise would be. Then a month or two before QE2 was scheduled to end and the FED was going to be a less player in the treasury market, rates started going down (and bond prices went up). The current right-wing obsession with minute rates of inflation is only matched by their unhealthy fetish for gold and the perceived value of currency. Who ever knew that the Chicken Inflation Littles would become so prominent (although many right-wing economists, such as Martin Feldstein, Greg Mankiw, Scott Sumner, Rogoff etc are now calling for moderate inflation targets). Read George Gilder and Milton Friedman, please. As Gilder points out, more important than losing your bowels over microscopic rates of inflation is obtaining taxes and regs that encourage entrepreneurship, innovation and risk-taking. That is how you get growth. Friedman said the gold standard was was lulus and UFO-adherents--and he advised the Bank of Japan to instigate moderate inflation in the 1990s. They did not, and have been a recession-prone, slow-growth economy ever since, falling behind China and S Korea on the world stage. BTW, Japan's stock market is down 75 percent since 1990, and their property markets are down by 80 percent--and still falling. Great investment climate in Japan. A real confidence builder. was there high inflation in the 70's? because if you say yes, then you must admit that inflation is high now. if we used the same measures, it would be reading 8%+, hardly miniscule. so, was there high inflation in 1976? are you really going to deny it? until you can answer this, you really have no leg to stand on. you'll just slink off as always and return spewing the same nonsense on another thread, but hope springs eternal. oh, and here's my cut and paste on japan. it really is must easier to deal with you now that i can just debunk your foolish augmentsfriedman was wrong. he posited a theory. the facts prove him wrong. "here, for the 18th time, is the study of WHAT ACTUALLY HAPPENED. there has been no correlation between monetary stimulus and real growth in japan. not all problems are monetary or susceptible to monetary solutions. if loose money has the effects you claim, there would be a correlation. that fact that there isn't means that neither you nor freidman can possibly be correct. given the magnitude of their policy, there is just no way there would be no visible R squared if it were working. japan's problems are demographic, not monetary. as ever, you'll slink off and return spouting this nonsense again on the next thread in blissful denial that once more you have been proven wrong, but that's why i instituted this cut and paste bunny response file. now i need put no more thought into proving you wrong than you do in learning the facts of the matter. I think you need to concentrate on your UFO studies. BTW, if the CPI has been undercounting inflation for the last 10 years, then all of our government stats concerning the number of Americans in poverty must also be vastly understated. And we must be falling way behind socialized Europe, where they have universal health care. Can California do better than this? Shouldn't that read: ...where they have universal wait lists for "health care" not a single American would consider anything better than third world and where the average among us live in conditions U.S. welfare recipients would consider beneath them and...Oh yeah...WE'RE GOING BROKE!" I remember in Russia we had universal healthcare. HA HA HA HA!!! Again, if you are citing Krugman as authority for your beliefs, you probably will want to go back and rethink your beliefs. only relevant if the market is not being manipulated by the Fed. I suggest that the TIPS more accurately reflects sentiment and it has reached a new high of 118 last week. i notice you dodged the question yet again. i think you fail to answer because doing so will irrefutably demonstrate how stupid your inflation notions are. so come on, a simple yes or no will do. your point on our economic stats is correct. we have vastly overstated real growth for the last decade in particular. but your point about europe is not, as they changed their CPI the same way we did, thus, the comparisons hold even though the data on both sides is wrong. there was barely any real growth from 2000-2009 . that's why people were not better off and had run up so much debt. That's Paul Krugman writing in 2007, before the current collapse of the US dollar and historic increase in our national debt. Then, he was worried about inflation. Now, with Obama in the White House, not so much. Friedman also predicted that if Nixon took the US off the gold standard, gold would drop to about $9/oz -- the amount he figured represented its industrial value. Need I point out how wrong he was? Japan has resisted inflation, it's true. Its remarkably stable currency has led to price drops (increased purchasing power) that has allowed the Japanese to enjoy a continued prosperous standard of living even though, by Keynesian standards, the GDP is stagnant. Of course, if the money supply doesn't increase, neither can the contrived GDP equation. The country, however, has an unemployment rate of 4.6% and continues to produce ever more producer goods. A "recession" we might wish for. Friedman said the gold standard was was lulus and UFO-adherents--and he advised the Bank of Japan to instigate moderate inflation in the 1990s. They did not, and have been a recession-prone, slow-growth economy ever since. Just how many more bridges and roads to nowhere and how much more borrowing and spending did you expect from the Japanese government. For your information, it tried to inflate and failed because the market needed a liquidation of malinvestments. All of the money printing and spending only went to prop up zombie businesses that should have been shut down so that the economy could grow again. Japan is a perfect example of what happens when inflationists like Friedman (or Krugman) have their way. Yes, because people need to be reminded of Friedman's ignorance about the role of commodity money. But the facts say otherwise. The government and BoJ tried to inflate by financing massive infrastructure projects and subsidizing weak companies. The problem is the massive debt that can never be paid back given the demographic pressures. Both Japan and the US are just as broke as the EU countries and will suffer far more than people imagine.